Many of us probably remembered when and where we got our first period. And we would probably also wish we'd been a little more prepared. If your daughter is approaching her first period, how can you help her be prepared so it will not embarrassed her or yourself too. 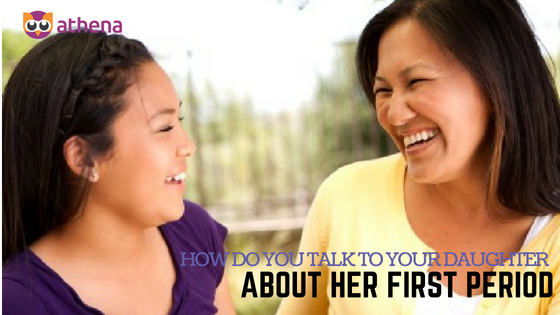 Here are some tips on how to talk to your daughter and get her prepared for that 1st period. 1. Brush up on the topic first before you chat. You’ll want to give yourself a quick refresher about menstruation so you’ll be able to explain how it works and be able to answer questions that might pop up. Go online to a reputable website and read over how it works and you’ll feel much more prepared for this important conversation! The more comfortable you feel about the information, the smoother the conversation will go. 2. Find a relaxed and comfortable place to chat. It’s best if you can start the conversation where its just the two of you without interruption. Ask her what she already know about periods. Confront concerns. Your daughter is probably wondering what her period will feel like, how long it will last, and how she can take care of herself each month. Let her know that asking questions is OK .
3. Make a period kit. Many girls fear they’ll get their first period at school or when they’re away from home. To help your daughter feel ready, buy a small zippered pouch and stock it with a couple of teen-size sanitary pads and a clean pair of underwear. Tell your daughter to keep the pouch with her at all times, and keep one with you, too, just in case. Her kit can also be a way to deal with another of the biggest period fears: a leak. “Tell her that if her underwear gets soiled, she can just wrap it in toilet paper and throw it away in the little trash can in the bathroom stall” and use the clean pair in her kit. Period mishaps are bound to happen, so help your daughter pick a trusted adult she can ask for help if she’s away from home. It may be a coach, teacher, counselor, or a friend’s parent. Also, teach girls to have each other’s backs. If your daughter thinks her friend is leaking, she should tell her -- and ask the friend to do the same. 5. Don’t focus too much on period problems. The idea of bleeding for a week each month is so overwhelming for girls that you don’t want to give them too much information up front about all the other “joys” of having a period, like bloating, premenstrual syndrome (PMS), and acne. Besides, some of these symptoms won’t show up until a girl has had her period for a couple of years. You can start by telling your daughter it’s normal for some girls to have cramps, back pain or tender breasts before or during their periods. She can ease the pain by putting a heating pad on her lower belly or back, and taking nonprescription pain-relievers.